By now, you’re getting the idea that I love hats. 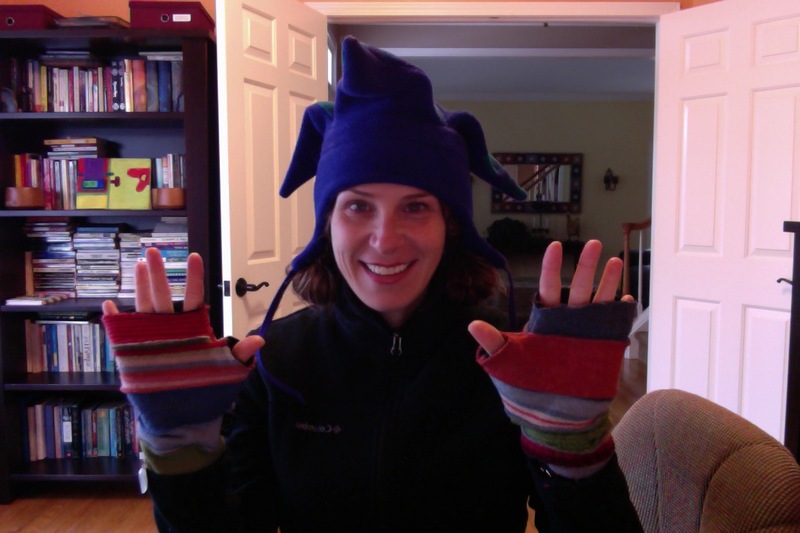 Since my last post, the temperatures took a major nose-dive, and in an effort to stay warm (and raise my spirits), I pulled out a few wacky hats from my collection. This little number was given to me by my friend, Teri. Someone in her family knitted (or is it crocheted? Hmmm.) especially for her. Can you appreciate the feather and faux gemstone? I knew that you could. I gave the original Spider hat to a dear friend, but when I had the opportunity to have another one, I simply had to do it. I have absolutely no idea why I made the Hang-10 sign with my hands. Now that my son is in 10th grade, my polar fleece jester hat rarely makes an appearance. Tech Support has never said he’s embarrassed to be with me, but I try to be sensitive and not push the dorky envelope too far off the table. 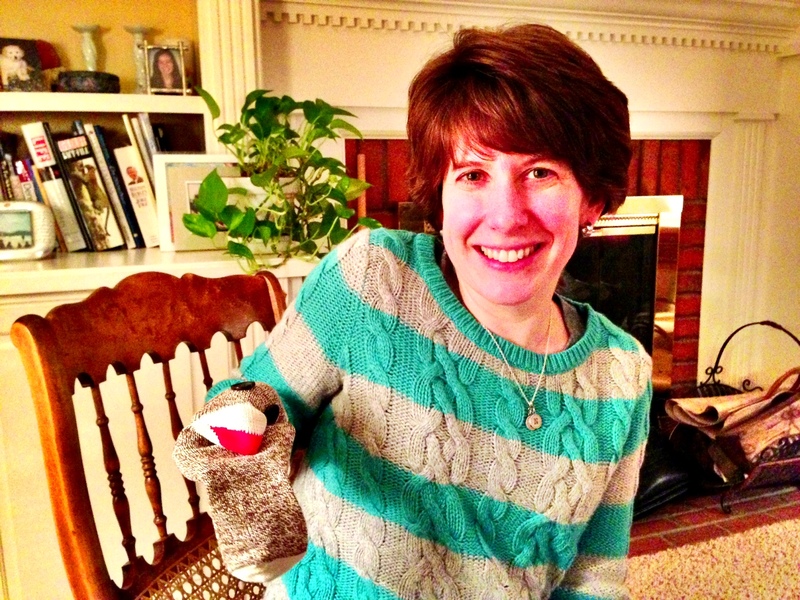 My amazing fingerless gloves are from Baabaazuzu, a company that was born in late 1993 after Sue Burns, a gifted graphic designer, cut up the shrunken remains of her favorite sweaters, pieced the fragments together and made jackets with matching hats for her two daughters. 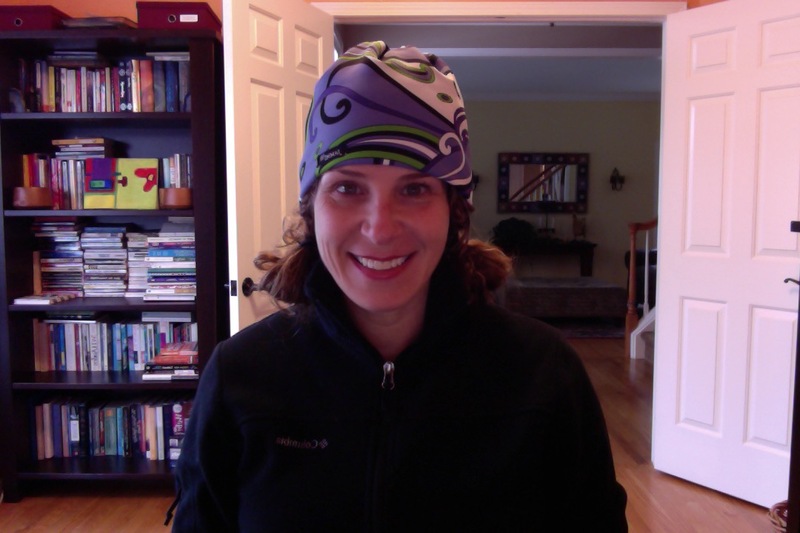 I won this colorful skully in a blogging contest held by my friend, author, Kasey Mathews. 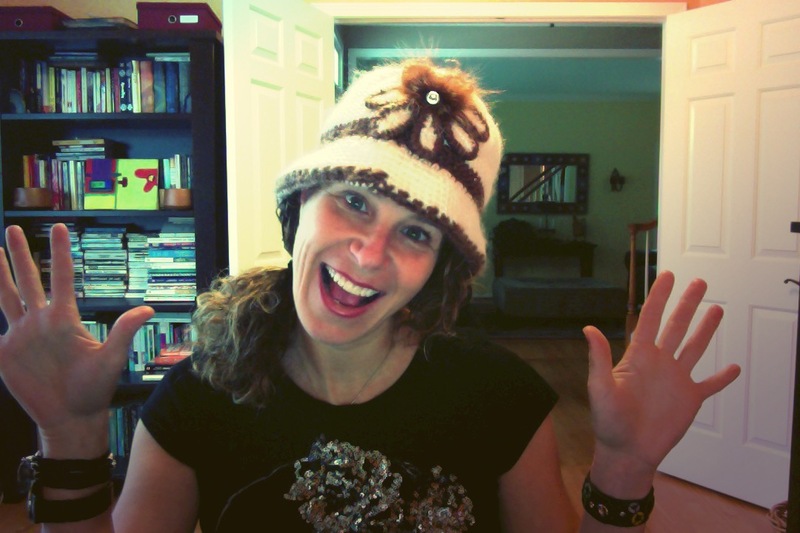 Jen Wagner the Creator of JAMMS hats designs these great warm hats that are wicked stylish. I love having a pop of color on my head on gray days. This stocking hat comes from HandCandy. It’s super warm on the inside, as it’s lined in polar fleece, and the tail is wicked long and can wrap around the neck so the wearer doesn’t need to fuss about a scarf. And while I love the colors and the mix of fabrics, this thing is heavy and leaves me feeling choked. Truth be told, I would have probably done better to swap this hat for a scarf or a pair of mittens because I really adore the varied textiles and broad stitchwork. For now, I wear this hat as a house-hat. A what?, you ask. 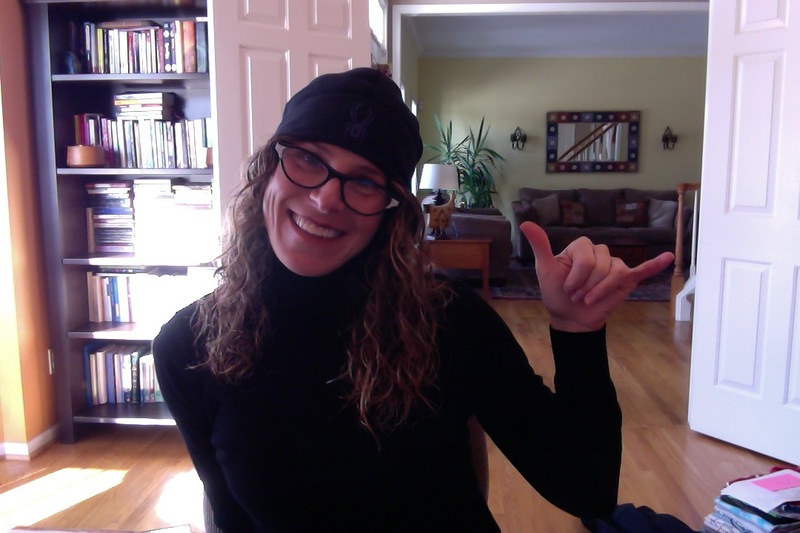 Sometimes it’s just so darn cold outside that the chill creeps inside so I keep my hat on even while I’m inside. And my fingerless gloves, too. They don’t come sexier than me, folks. I’m always looking to add to my hat collection, so if you have a hat you’d like to donate to the cause, or if you represent a hat company and you’re looking for a middle-aged spokesperson, I’m your girl. 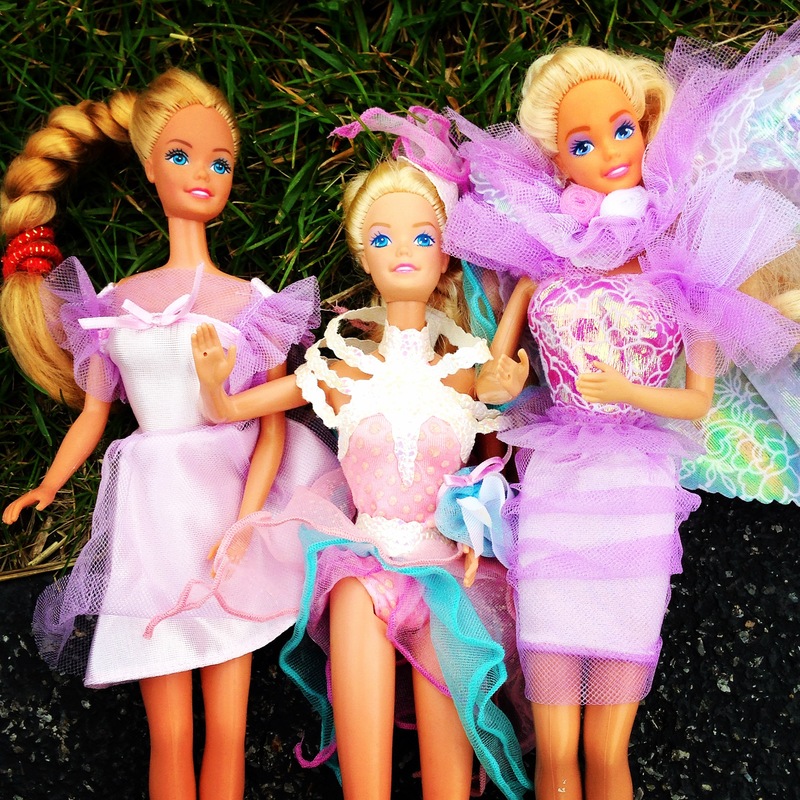 Today, these gals got all gussied up, sprinkling themselves with fairy tale magic in an effort to kick off 2015 right. So where should these 3 lovely ladies go to celebrate the new year? Happy New Year everyone! 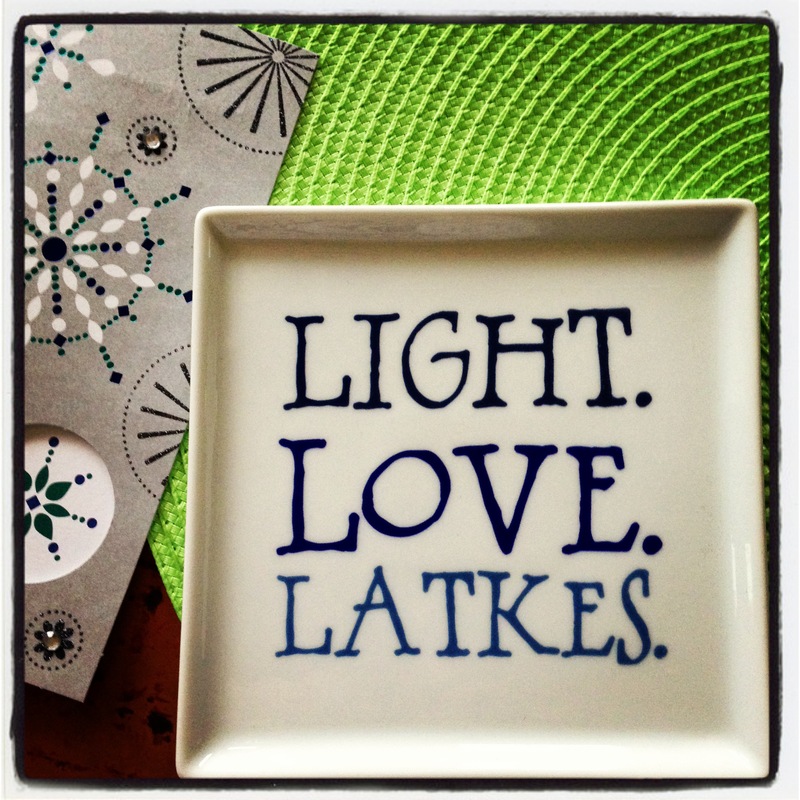 May we all enjoy a year of good health, love and peace. That’s my niece up there. Could she be any more gorgeous? 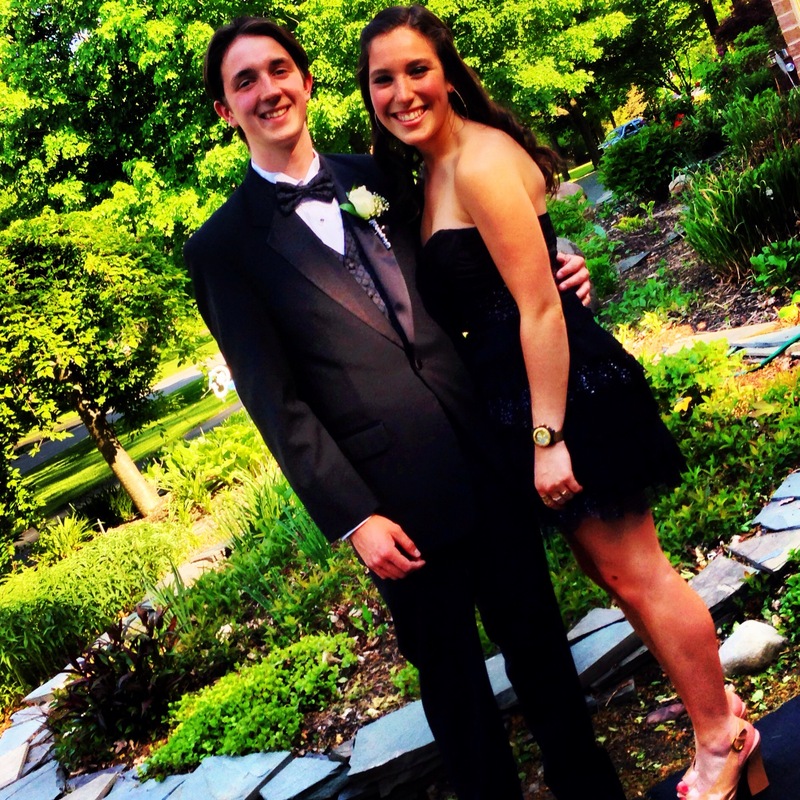 Oh, and her boyfriend looks fab in his tux, too. My niece went to Senior Prom with her boyfriend a few weeks ago. As I stood nearby, snapping photos, I was transported back in time. To the mid-1980s. To my own school formals. TB and me. 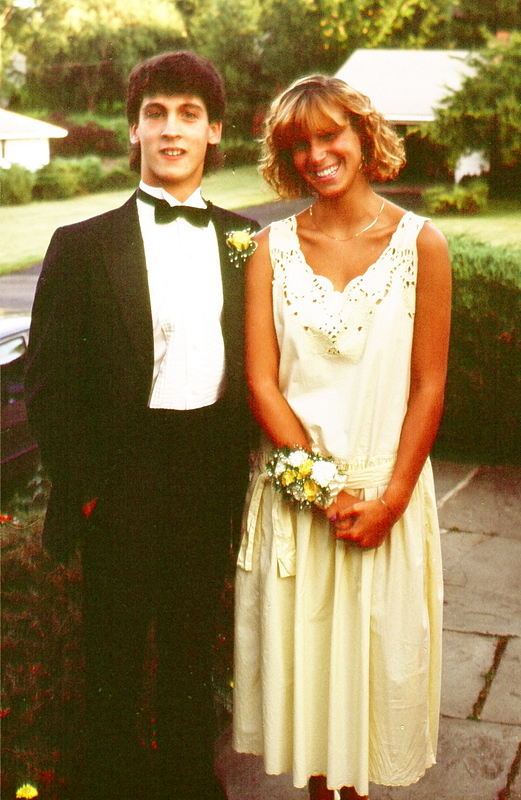 Junior Prom, 1984. I went to junior prom with TB, a boy I spent most of middle school trying to get to fall in love with notice me. Lord knows, we spent many afternoons in detention together as a result of misbehaving in French class. Before he moved to Philadelphia, I realized we were always going to be “just friends,” which was good enough for me. I sort of figured I’d never see him again, but he magically materialized to take me to prom. First, let’s just establish TB looked awesome in his tux. Okay, now let’s talk about my dress. Featured in Seventeen Magazine, my dress was a gauzy, white Gunne Sax for Jessica McClintock that covered me from chin to ankle; it had three layers of crinoline and 10,000 buttons up the back. I was hermetically sealed inside my dress. All I knew was that I felt like Madonna in that dress. Seriously, from the neck down, I looked like Madonna. Sadly, we must address things from the neck up. A few months prior, I’d butchered my long mane and had not yet figured out quite what to do with what was, tragically, a long brush-cut. Or a lady-mullet. In an effort to try to make people not notice my heinous hair, I stuck an over-sized silver safety-pin through the extra hole in my left ear lobe. Because I was that cool. JMo and me. 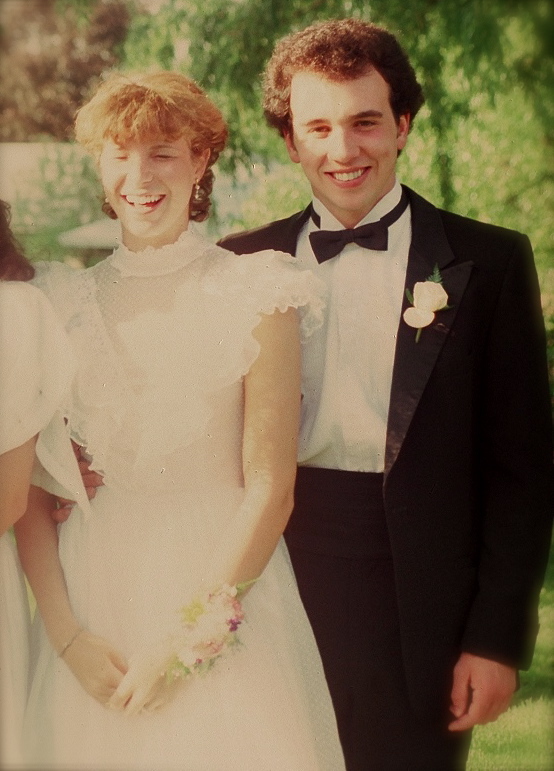 Senior Ball, 1985. For senior ball, I was slightly better prepared. First, let us establish that JMo looked awesome in his tux. Now, about my dress. As it turned out, my poofy dress from the year before was really uncomfortable. The crinkly crinolines had filled the entire backseat; it had been hard to walk, and did I mention that I was decidedly not hot? Senior year, I decided to tone down my attire and wear a simple yellow dress. Alas, there was no teenaged version of “Say Yes To The Dress” because somehow I ended up looking like I had been dipped first in a vat of French’s mustard and then into a second vat of Hellmann’s mayonnaise. Seriously, I had no business wearing pastel yellow. I know you can’t tell from the pictures, but I looked jaundiced. Luckily, most people were blinded by my like totally radical Sun-In highlights and my tan, both of which I had been cultivating after school for weeks while ignoring my upcoming Trigonometry final. I didn’t do a lot of primping for either prom. I bought a dress and put it on. All I’m saying is thank goodness there was no Twitter back in the 1980s, because I would have been all over that and it would have worked me into a frenzy! No, I was blissfully oblivious, so I didn’t stress out about prom in advance at all. Time spent preparing my hair for junior prom: zero minutes. For senior ball, I actually had hair, so I did use a little mousse which, thankfully, had been invented earlier that year. Truthfully, I do remember a wee bit of mental anguish at both dances. Even though I wasn’t dating either guy, I still wanted the romance of the evening. I still wanted my dates to ask me to slow dance. I mean I was scared, but I still wanted to be asked. Ask me. No don’t ask me. Please ask me. Wait, I don’t know what I’m doing. Because, really, I had no idea. But I so wanted to know. I imagine some things will never change about formal dances: the grown up feeling of getting dressed up and “going out on the town” without one’s parents; the freaky-deaky feeling a girl gets in her stomach as she sees her prom date pull into the driveway; those awkward posed moments where parents hover, taking zillions of photographs from every possible angle; the worry that a zit could erupt at any moment. Even though the dresses are better, I still think of prom as an awkward place, a threshold between adolescence and adulthood where no one really knows what to do. So people just hold onto each other and spin in circles for a little while. Right up until I learned I failed the Trig final. What did you wear to prom? Did you think you were hot? Were you? Really? I’m probably the most brand loyal person out there. What can I say? When I find something that works, I stick with it. 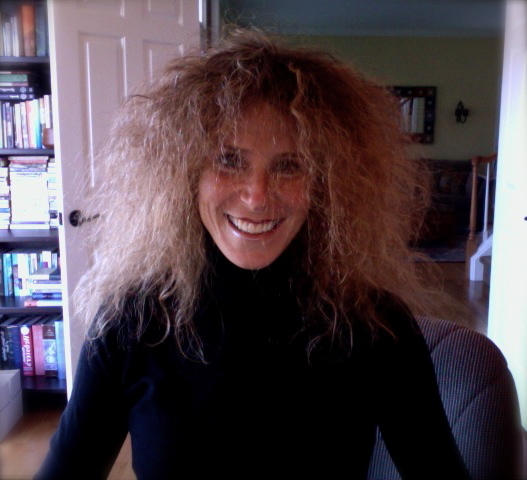 As my longtime readers know, I have a love-hate relationship with my hair. Despite the fact that I have stretched and pulled it, given myself deep conditioning treatments, and slept in bandanas in an attempt to give myself straight, swingy hair, I have the kind of follicles that morph into a frizzy pyramid if combed or touched. In 1985, I fell in love with a hair care product. You guys, they are discontinuing it. Want to know what I’ve been doing since I heard the news? Click over to Jess Witkins’ blog to find out the rest of the story. Be prepared to tell me about products you have loved and lost. When I moved to Rochester from New Orleans in 1995, the sunflowers in my backyard turned their yellow heads to face a blue, cloudless sky. That fall, the leaves on the maple trees turned red and yellow and brown and fell at our feet, but the sun stuck around. One October weekend, my husband and I hopped in his car to scout out a grape festival. Everyone kept saying how unseasonably warm it was. We hardly heard them as we scooped gobs of pie directly out of the tin and into our mouths. Standing there in our short sleeves, it seemed the warm weather would never end. Clearly, moving to Western, New York had been a delicious choice. One October afternoon, a friend came to help me unpack the last of my boxes. 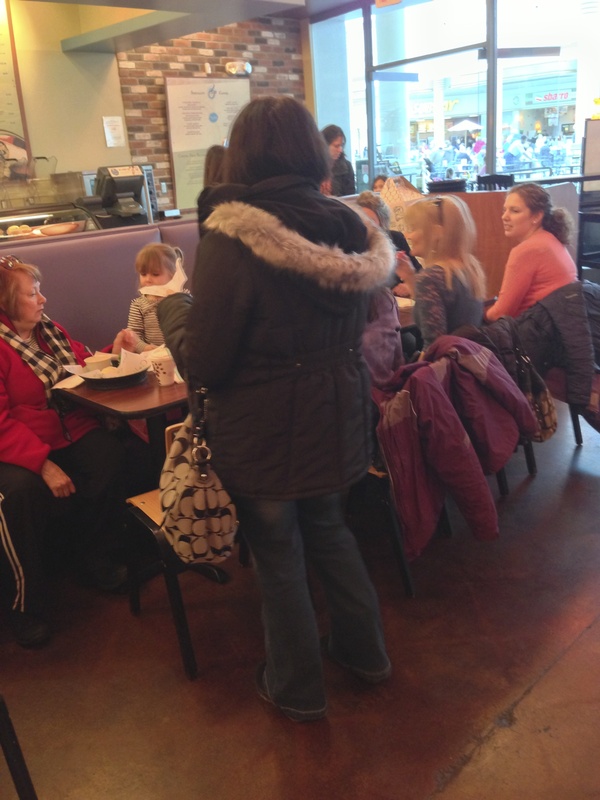 “Where are your coats?” she asked. After five years in New Orleans, I didn’t have many. I held up my denim jacket, a green raincoat, and a few sweaters. But I ignored her. Because what did she know? Everything was so cozy in our apartment, and the afternoon light never stopped streaming through the stained glass windows of our apartment. One morning, I went outside to find everything blanketed in white. Shivering, I brushed off the windshield and hopped inside to turn on the heat. And after work, I drove directly to the nearest mall to buy my first sleeping bag coat. Let’s be clear. My sleeping bag coat isn’t pretty. It isn’t fashion forward. 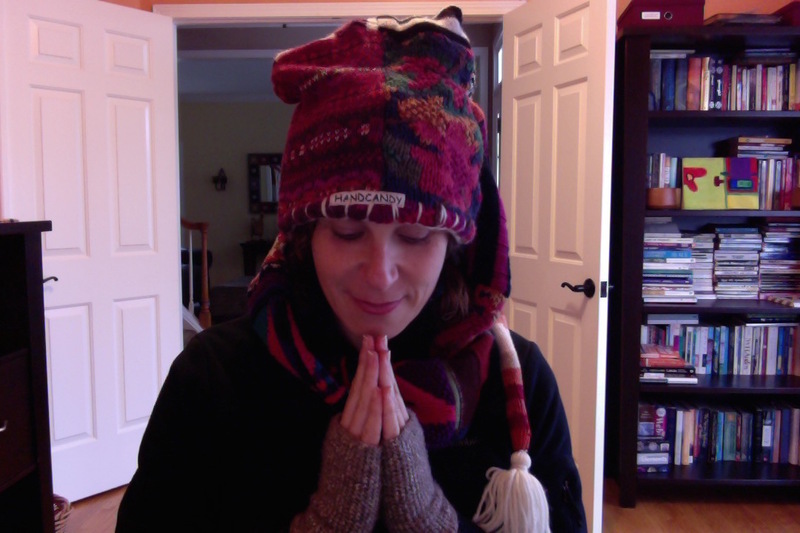 But once the temperatures fall below 40 degrees, I am never without it. Black and puffy and filled with down, I wear it all the time. While I make breakfast. While I do the dishes. While I run errands. I have even slept in my sleeping bag coat. Several years ago, we had a major ice storm. Trees cracked and power lines went down. People lost power for over a week. It was mid-April, and I could see my breath in my house. Recently, I realized sleeping bag coats are kind of a Rochester thing. Everywhere I go, there they are. 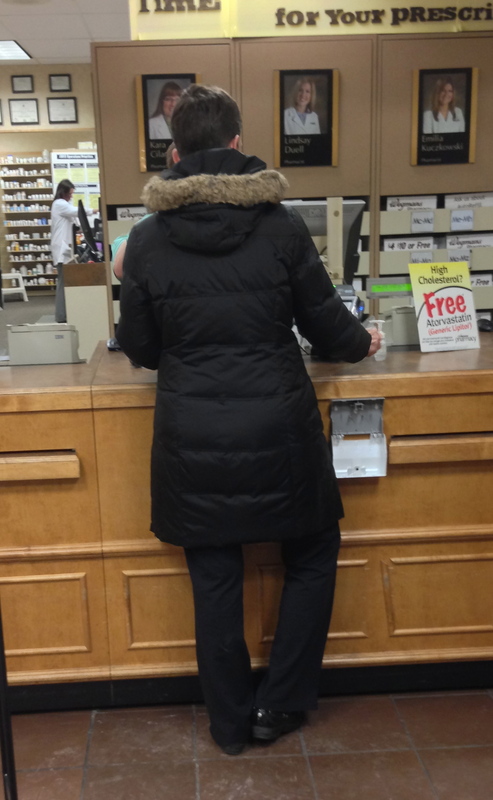 And again at the pharmacy. I know some ladies will argue that fashion should always come first. In my experience, these women are usually in their 20s. They often live in warm weather climates and wear bikinis with 5” hoochie-mamma heels. In Rochester, we have to be pragmatic. Because when it is cold for nearly six months of the year, we have to wear boots. And hats. And scarves. And mittens. Eventually it will stop snowing. The daffodils and tulips will dare to poke their heads out of the cold hard earth, and the trees will decide to sprout leaves. Things will green up. The thermometer will register above 60 degrees. Then, and only then, will I dare to step out of my sleeping bag coat. What is the signature look in your neck of the woods? I’m linking up with the fabulous folks at Yeah Write. Click on the hat to read good stuff from other peeps. What Made the Happy House Happy? You left such positive comments about my recent post regarding our second home, I felt I needed to let you in on a little secret. You know how I told you my husband fell in love with a sandy lot? It’s true. The lot was nothing but sand when he first saw it. Now you see why we call it “The Happy House”! Talk about *erecting* a house. What other construction related double-entendres can you think of? Wow, I’m really *opening myself up* for this one. 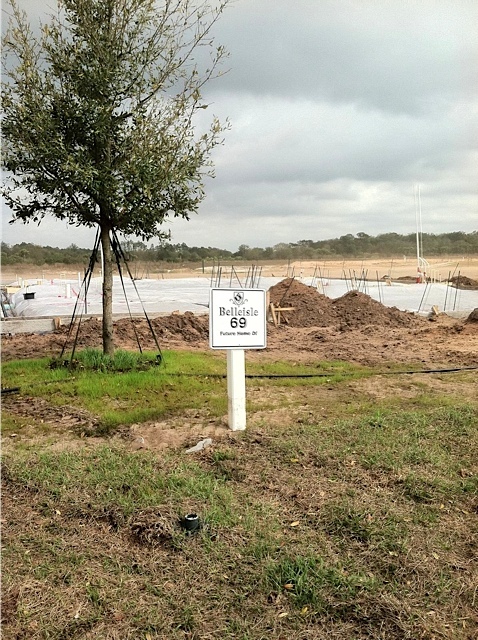 If it helps, imagine you are building a home in Florida. Speaking of which, I wonder if it is *warm and wet down there*. NOTE: This was my 469th post. You can’t make this stuff up. Well then surely you remember when Rudolph the Red-Nosed Reindeer accidentally lands on “The Island of Misfit Toys,” where unwanted playthings with cosmetic or physical flaws live until the island’s ruler, King Moonracer, can find homes for them? 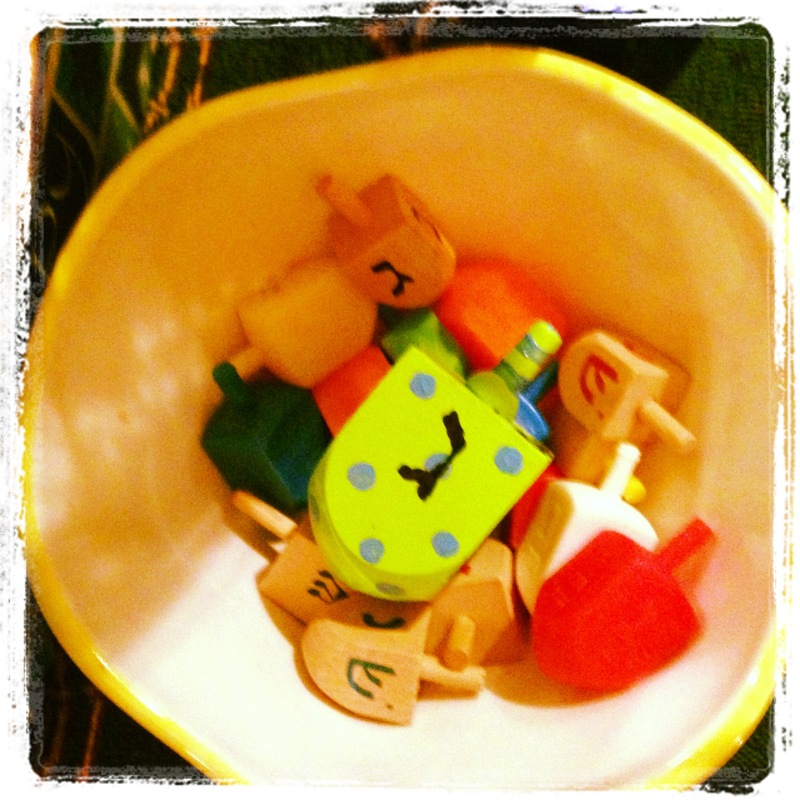 Why am I babbling about old label makers and effed up toys? For several years now, the members of my neighborhood book club have gathered after the winter holidays and, in lieu of discussing a book, each of us brings one gift that is so freaking craptastic we just have to get it out of the house. And give it to someone else. You know, because one woman’s trash is another woman’s treasure. 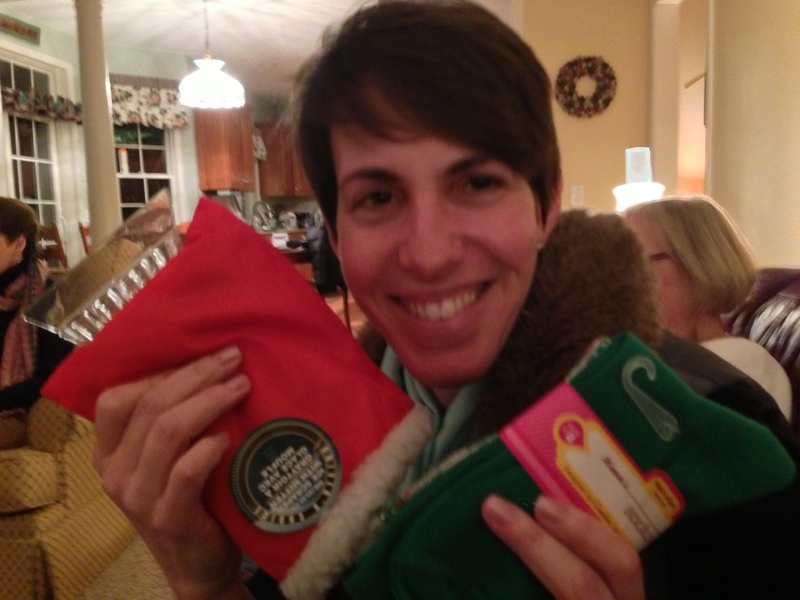 Last night was our Annual De-Gift & Re-Gift Party. After everyone ate their fill of yummy nom-noms and slurped down some wine, our host told us it was time to get to it. We circled her coffee table where all the bags of horror sat sagging in their repurposed wrapping paper. The rules for this year’s swap were quickly established. We would go in numeric order. When it was someone’s turn to pick, that person could either select a new gift or steal a gift that had already been opened. 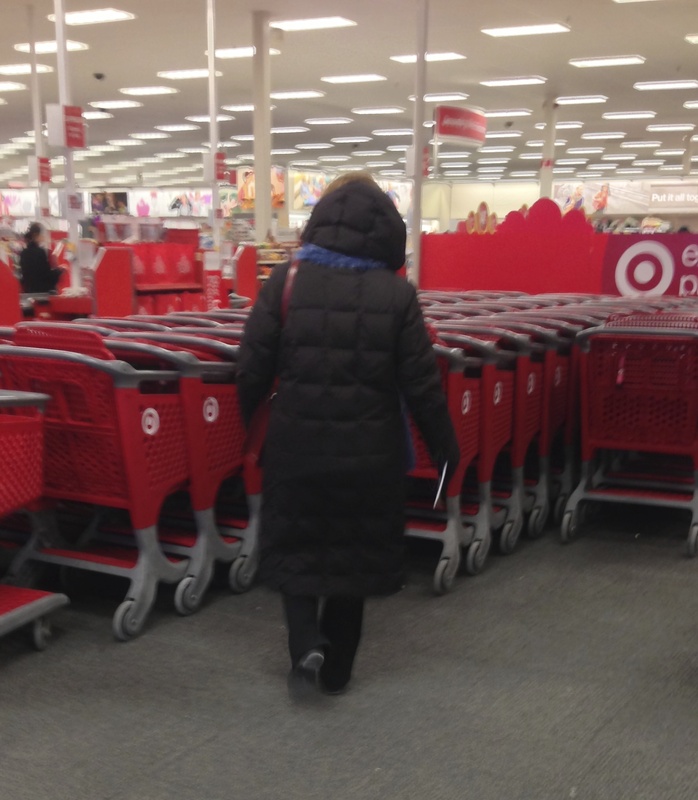 Once an item had been swapped three times, that item could no longer be stolen. 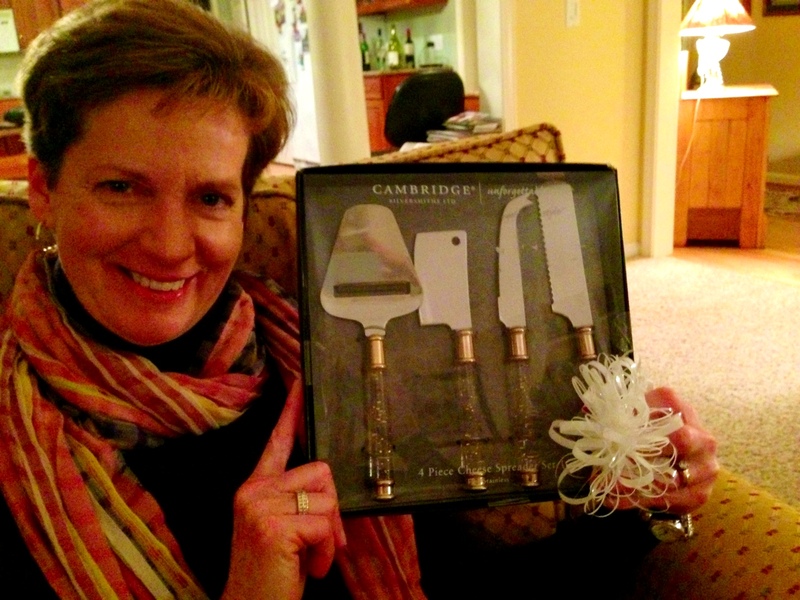 Don’t leave unwanted gifts at the host’s house. Or else. Our host handed us numbers that she had scribbled on slips of yellow paper. I must have been born under a star or something because I got the highest number, which meant that I was going to see most, if not all, of the goods that came before it would be my turn to pick, thus ensuring my victory would be sweet. Kate went first. 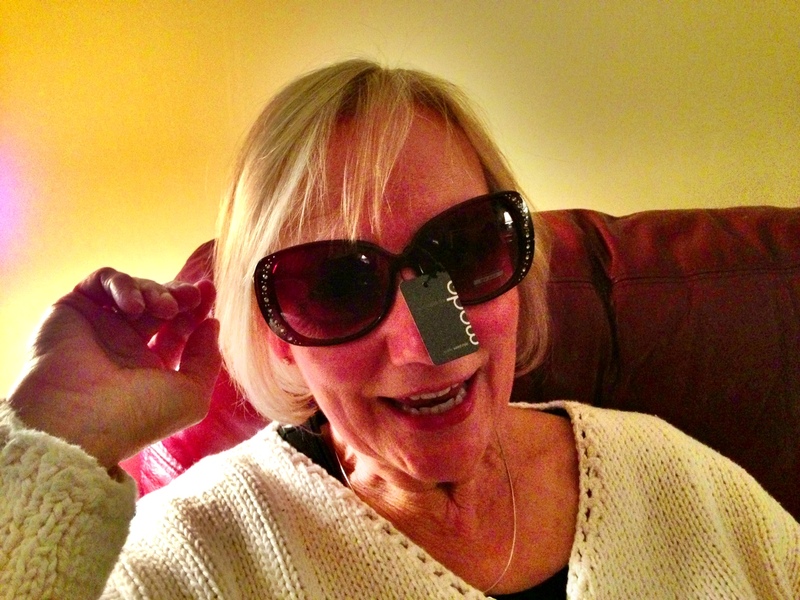 Reaching into her bag, she revealed two pairs of holiday socks and the windshield scraper Santa might use on his car. You know, if he didn’t have a garage and the reindeer were tired, and Mrs. Claus needed to pick up a few items from Bed, Bath & Beyond up there at the North Pole. After she showed everyone her goods, Kate burst into laughter and confessed that she’d picked the gift she’d tried to dump on us brought to the table last year. Like the mythical holiday fruitcake, Kate’s bag o’crap had returned to her. Liz unwrapped a frog ring, which broke the instant she put it on her finger. 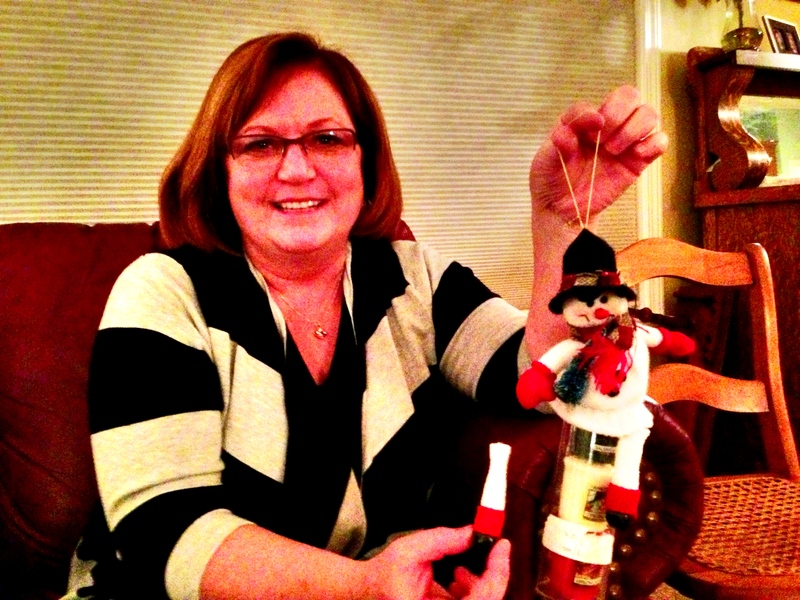 But she also got the Wine Bottle Sock Monkey, which she assured us would make a great puppet for her sons to play with. 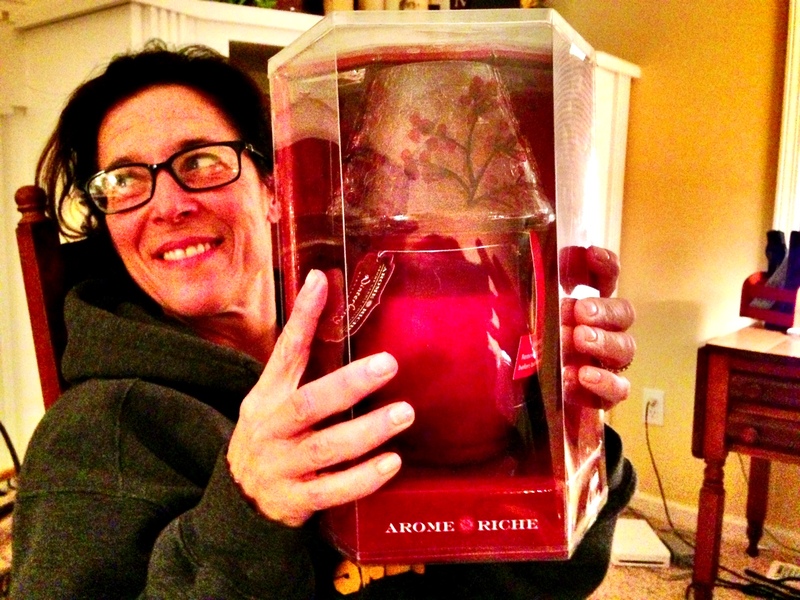 Cindy #1 took home the enormous cranberry scented candle that thought it was a lamp. Seriously, check out that shade. The thing weighed eleventy-six tons. Look how excited Cindy is! Cindy #2 scored a pair of faux-gold earrings circa 1986. And look! 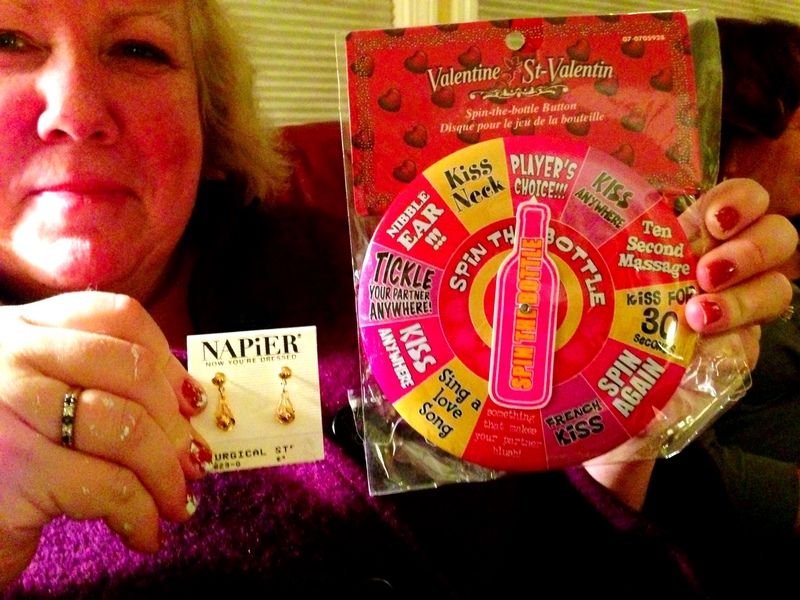 She’s set for Valentine’s Day with the Spin-The-Bottle-Button. 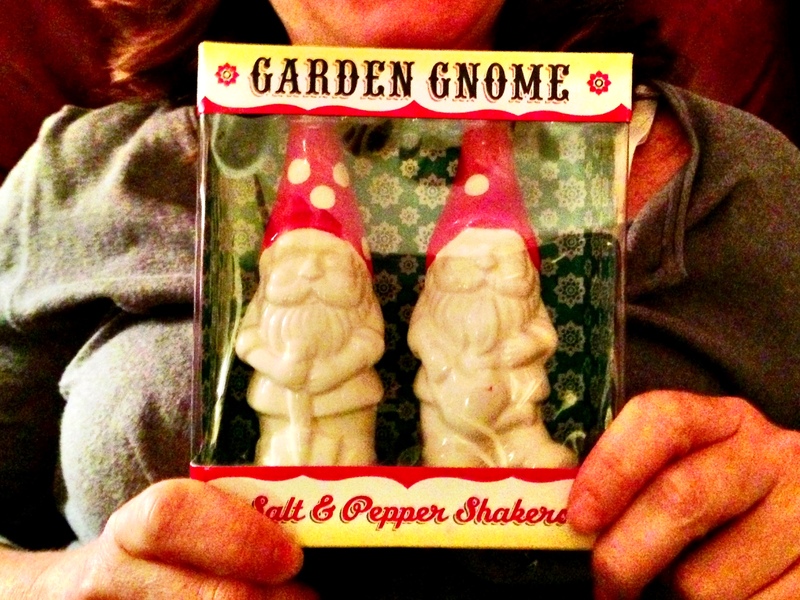 Lori got the Garden Gnome Salt & Pepper Shakers. I know that someone out there would love these. But probably not Lori. You cannot really appreciate the bedazzled, super glittery handles on the faboo 4-piece cheese spreader set that Mary Jo landed. At first, we thought the handles were filled with Goldschlager. But no. Everyone agreed the spreaders were very functional and stabby. 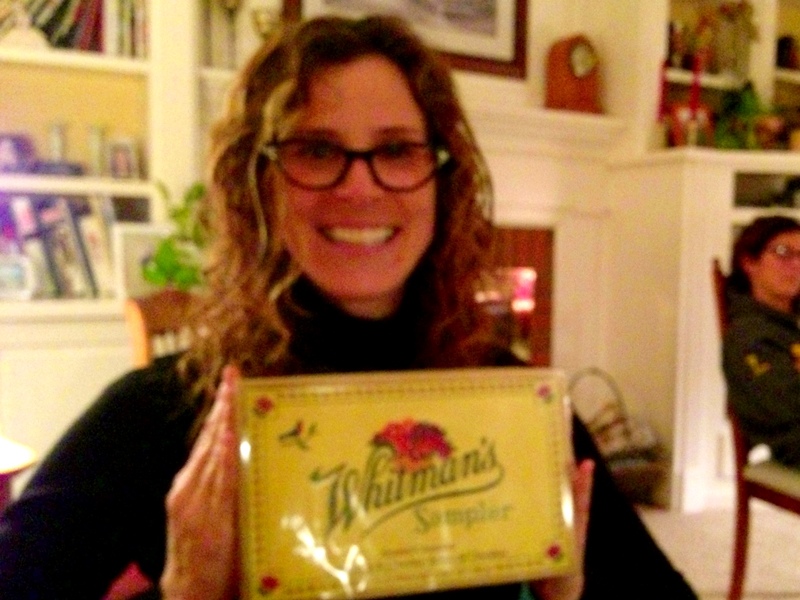 I peed in my pants a little when I won the box of Whitman’s chocolates. I told you my ending was sweet! That’s called punny foreshadowing, people. No matter what we tossed in the donations pile brought home last night, we were all winners because caring is sharing. No. Because each time the members of book club get together, we learn more about each other. Once, I Tricked My Book Club Into Writing. 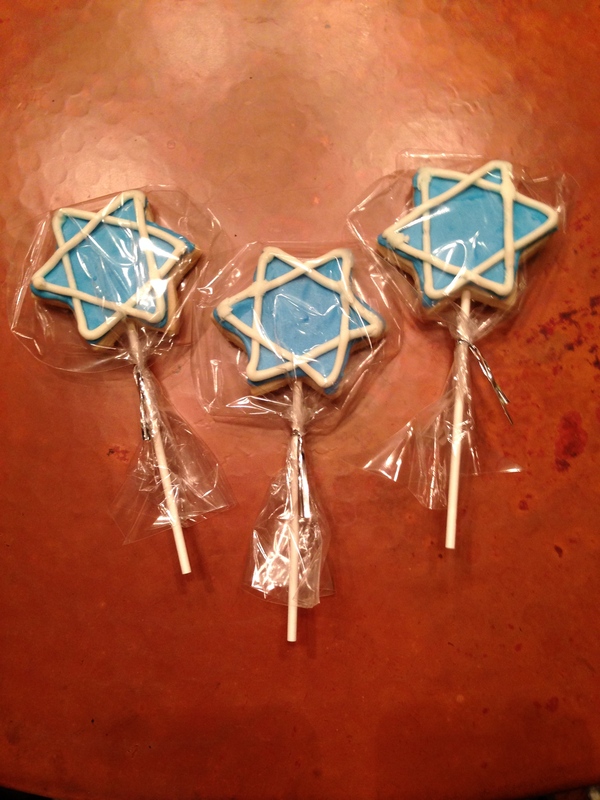 (They forgave me.) So whether we yadda yadda yadda about books, share life lessons, or trade playthings from “The Island of Misfit Toys,” it is always a delight. I am blessed to have these women as neighbors and plan to enjoy our ever-evolving reindeer games for a long time. Anyone else have non-book-related book-club traditions? What else do you do in your book club besides drink wine talk books? Recently, I showed you the line-up of amazing bloggers who committed to sharing their most embarrassing moments over the course of the year. If you surf Twitter, you will be able to find the series under the hashtag #SoWrong. And a lot of other crazy shizz, too. Probably. Last week it occurred to me that it wouldn’t be right if I didn’t share one of my own heinous moments. Gulp. Here it is. Click on the eyeball to see who else is participating in this series! During high school, I worked at a department store in a local mall. At its peak, the chain had ten locations, and I spent many afternoons, weekends and vacations behind the costume jewelry counter, helping blue-haired ladies decide between faux-pearl earrings and plastic white clip-ons. When I came home from college in the winter of 1985, I learned I’d be working in fine jewelry where black surveillance cameras hovered over the display cases. Seriously. Look at those chompers. And that chin. One day, a man in an expensive gray suit leaned against the glass case where the 24k gold was kept and flashed me his whitest smile. My heart beat loud in my chest. Gray Suit was cute. I wondered if he was single. “Is there something you’d like to see?” I asked, hoping he would say something like: You. I’m here for you. “Didn’t Carol tell you?” Gray Suit asked, invoking the name of my supervisor. When I shook my head, Gray Suit frowned. My teenage heart dropped. “Let’s start over.” Gray Suit outstretched his hand. We shook hands the way my father always said was indicative of a person with character: firm and not too quick to release. His lips moved. “I’m John Stevens, the gold rep. I come to swap out the inventory occasionally.” He set a hard, silver briefcase on the floor, bent over and produced several, rose-colored velvet bags, which he set on the glass countertop, careful not to leave messy fingerprints. Isn’t it so sparkly and pretty? John glanced at his watch. “I still have to get to North Syracuse, Camillus and Clay.” I could feel his frustration. “Carol should have told you I was coming.” John shook his head. “I guess I’ll go see Mr. Big Boss…” He leaned over to lift the handle of his briefcase. And I should have let him go. Oh, I should have let him go. But I was 18-years old. And I didn’t want my supervisor to get in trouble with Mr. Big Boss. And there was this small stupid part of me that hoped that John Stevens, the hot guy with the great smile, might want my phone number. Or something. So I did as I was told. I drifted over to the drawer where the key laid waiting inside a small white cup. And somehow I was pushing the tiny tarnished key into the lock. Once the lock was off, I slid open the doors, dropped to my knees, dragging all the gold into one clunky pile. John handed me a velvet bag, which I filled and set atop the empty display case. He smiled as he flipped open his briefcase and placed the bag inside. He tapped the top of the tall earrings tower with his fingertips. I nodded. Of course he would. He promised he’d be right back. When Carol returned from her break, I told her John had been there. “Who?” she asked absently as she tidied up around the cash register. Carol looked at me with big eyes. I was a stupid girl. 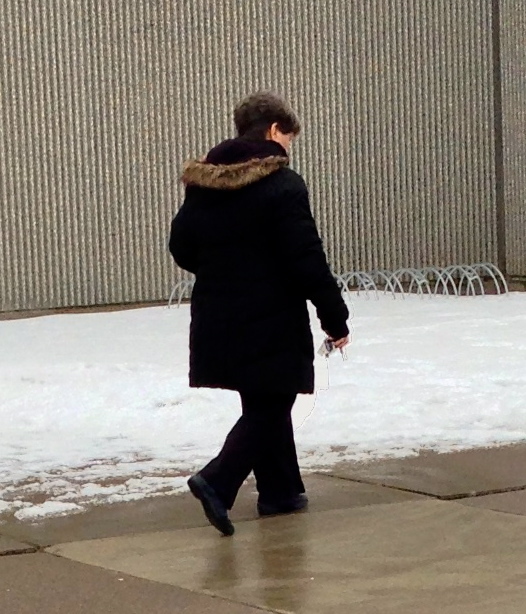 Notoriously unflappable, Carol stomped her heel on the floor and swore. I had done something really bad. I was elated. Thank goodness. We could get the footage and give it to the police. We would be able to catch the bad guy. And, I thought, he knew how to work me. I was sure I was going to be fired. I braced myself for it. It was not the first time nor would it be the last time that a boy would trick me. But it was a very embarrassing moment: the day I swapped nearly 10K in gold for a phony smile. The fancy department store where I worked opened its doors in 1896. In 1992, the corporation filed for bankruptcy and four stores closed. Under pressure from creditors, Mr. Big Boss, grandson of the founder, sold the company and its remaining stores in 1994, just two years short of their 100-year anniversary. I have always felt partially responsible. Have you ever done something incredibly stupid at work?